In this month’s Five Wines Under $15, we take a look at Dusted Valley Vintners’ Boomtown wines. 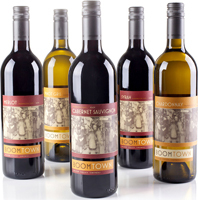 “A throwback to the energetic Roaring 20s, Boomtown embodies the essence of celebration and our booming Washington wine industry.” So reads the side of the Boomtown labels. And make no mistake, Washington is indeed a boomtown. The state is approaching 800 wineries – up nearly threefold over the last decade. Washington produced a record crop of 188,000 tons of wine grapes in 2012. Grape acreage is also expected to nearly double by the end of the decade. Dusted Valley has very much embodied this growth. Based out of Walla Walla and with a tasting room in Woodinville, the winery currently produces 25,000 cases annually of its Boomtown wines alone. The label includes a Pinot Gris, Chardonnay, Cabernet Sauvignon, Merlot, and Syrah (I see a ‘Boomtown Blend’ in their future). Most of the wines are sold out of state, providing more Washington wines in the value category for consumers around the country to find. What's next for Boomtown? Owners Chad Johnson and Corey Braunel plan to double production in the next five years. So much like with the rest of Washington, don't look for the boom times to stop any time soon. (Good) A moderately aromatic wine with red apple and pear. The palate is medium bodied, drinks off-dry but with crisp, mouthwatering acidity. 100% Pinot Gris. Fermented and aged in stainless steel. 13.5% alcohol. Sample provided by winery. (Good) An aromatically appealing wine with yellow apple, spice, and floral notes. The palate is medium bodied and drawn out with abundant floral flavors and a slight spritz lifting the flavors. 13.7% alcohol. Sample provided by winery. (Decent/Good) A moderately aromatic wine with crushed peanuts, mint, and red fruit. The palate is light and style with grainy tannins. 84% Merlot, 16% Cabernet Sauvignon. Aged in French, American, and Hungarian oak (50% new). 14.4% alcohol. Sample provided by winery. (Decent) A moderately aromatic wine with herbal notes – leaning toward the green, ash, and cherry. The palate is distinctly herbal with grainy tannins. 82% Cabernet Sauvignon, 6% Petit Verdot, 6% Malbec, and 6% Merlot. Aged in French and American oak (40% new). 13.9% alcohol. Sample provided by winery. (Good) Lightly aromatic with mesquite, blueberry, olive, and violets. The palate is medium bodied with citrusy acidity and game flavors accented by chalky tannins. A very pleasant, easy drinking Syrah. 97% Syrah, 3% Mourvèdre. Aged in French and American oak (30% new). 14.6% alcohol. Sample provided by winery.